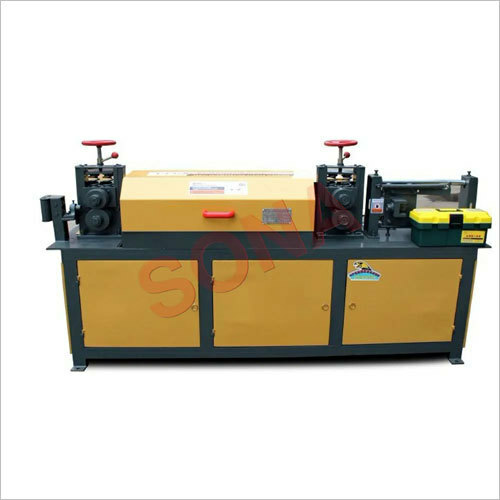 With optimum capability and rich industry expertise, we have been able to emerge as a trusted supplier of Rebar Decoiling Machine. Our machine is specifically designed to straighten the strong round steel along with the thread screwed steel, ribbed steel, hot and cold rolled rebar and more. The machine is widely used for the building construction as well as steel rolling mills. This machine is highly appreciated in the construction industry due to its high toehold speed, straightening steadiness and cutting for working in a superior, safe, and constant output. Rebar Decoiling Machine is available in different power specifications as per client's requirements. 1) Automatic control panel with PLC controller for easy operation. 2) High speed drive rollers alone with pre straightened provide high capacity. 6) Requires low maintenance cost.